Scalability is one of the most relevant features of today’s data management systems. In order to achieve high scalability and availability, recent distributed key-value stores refrain from costly replica coordination when processing requests. However, these systems typically do not perform well under churn. 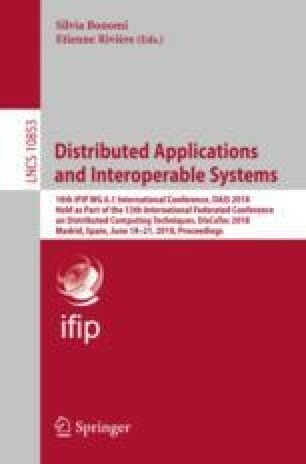 In this paper, we propose DataFlagons, a large-scale key-value store that integrates epidemic dissemination with a probabilistic total order broadcast algorithm. By ensuring that all replicas process requests in the same order, DataFlagons provides probabilistic strong data consistency while achieving high scalability and robustness under churn. The authors would like to thank the anonymous reviewers for their valuable feedback. This work was partially supported by Project “TEC4Growth - Pervasive Intelligence, Enhancers and Proofs of Concept with Industrial Impact” (NORTE-01-0145-FEDER-000020), financed by the North Portugal Regional Operational Programme (NORTE 2020), under the PORTUGAL 2020 Partnership Agreement, by the ERDF – European Regional Development Fund through the Operational Programme for Competitiveness and Internationalisation - COMPETE 2020 Programme within project “POCI-01-0145-FEDER-006961”, and by National Funds through the Portuguese funding agency, FCT – Fundação para a Ciência as part of project “UID/EEA/50014/2013”.